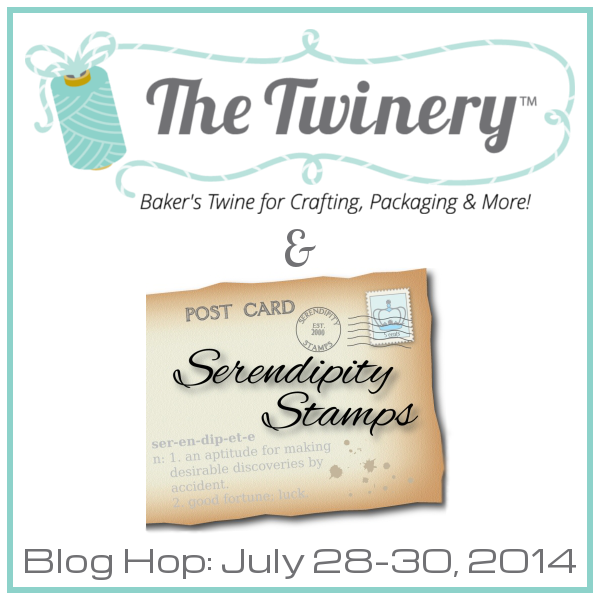 The Twinery and Serendipity Stamps Blog Hop! Hello friends and welcome to The Twinery and Serendipity Stamps blog hop! If you're here from Kathie's blog, you're in the right spot. If not, head over to The Twinery blog to get started! I've had a lot of fun being a guest designer with Serendipity Stamps this month on their challenge blog where the challenge was to use some twine. 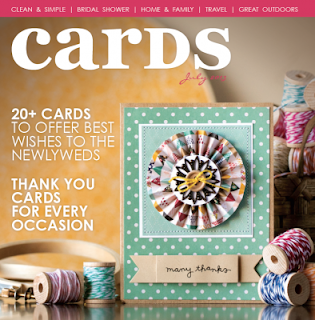 You can see those card projects where I used their wonderful stamps here and here. For the hop, I decided to make something focusing on their dies - door hangers! I had a college sorority reunion a couple of weekends ago and we rented a big house in Palm Springs where we spent the weekend acting silly and reminiscing about all of the fun we had living in our sorority house. For the rental house, I wanted to make some little keepsakes and decided on the door hanger project. The door hangers themselves were relatively easy to make. I cut a sheet of 8.5x11 card stock in half from top to bottom and then trimmed sheets of patterned paper to layer over the card stock. I grabbed a large circle die and cut the hole for hanging over the doorknob and then it was all about decorations. I asked some of the women for photos from our college days to add to the hangers (photos have been blurred to protect the innocent...) :) and added various stickers, glittery stars, sequins and twine. 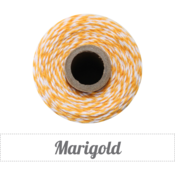 Our sorority colors are cardinal and straw so I used maraschino and marigold striped twine to accent each hanger. Our sorority mascot is an owl so you can see the wonderful owl die featured on all of the hangers. I ended up making a total of 6 hangers (the rest are similar so I'm sure you get the gist of the project) and the women ended up flipping coins for who got to take them home. I'm so happy they enjoyed the project and I hope you did too! 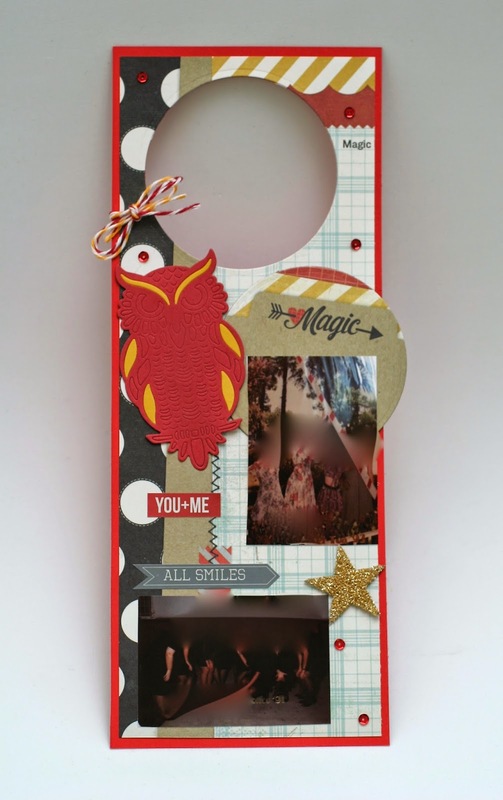 Now you can head off to Birgit's blog for more inspiration! As usual with these wonderful hops, there will be prizes. Please check out The Twinery and Serendipity blogs for all of the details! I started off with a red card base and then added a layer of glittery Christmas paper. I stamped and embossed the lantern using gold embossing powder and then stamped the candle, flame, and glow inside. I added some stamped holly leaves and sequin "holly" and twine to finish the card. 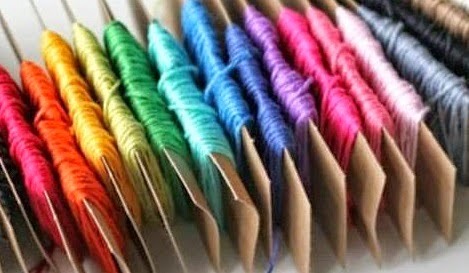 Thanks so much for visiting and I hope you can head off to Lynn's blog for more crafty inspiration! The Twinery and Poppystamps Blog Hop! Hello friends and welcome to the first of two days of fabulous blog hops with The Twinery and Poppystamps! I was so excited to work with Poppystamps dies and twine and hope you are inspired by the projects you see over the next couple of days! Before getting started, I must apologize for the quality of these photos - I shot all of these this week expecting to be able to edit them as I usually do but I am having a lot of problems with iPhoto crashing and can't get any editing done. I hope you can see the projects beyond the not-so-great photos and I will replace them with edited versions as soon as I can! 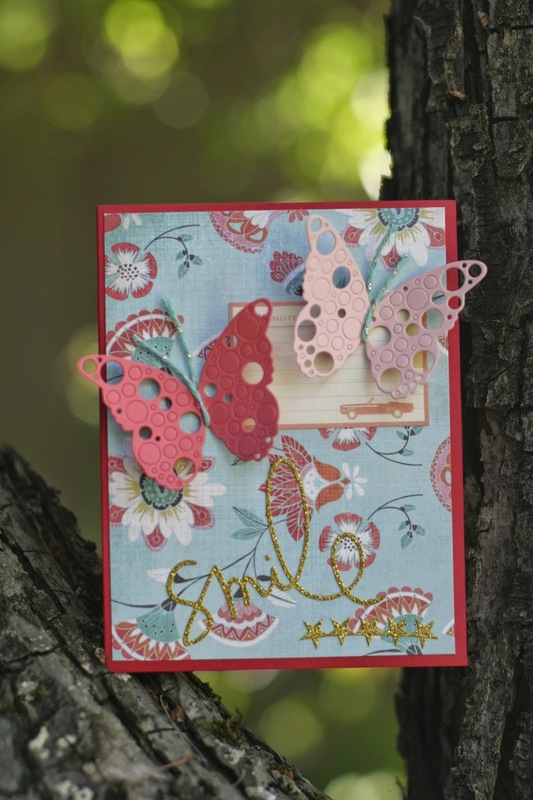 The first card showcases the Samirah Butterfly die and I had so much fun popping some of the little circles out. A side benefit of these wonderful butterflies is really fun confetti! :) I layered a piece of floral patterned paper on a red card base and added the gold glitter sentiment, stars, and a coordinating sticker. I cut two butterflies out of two different shades of pink/coral card stock that matched the patterned paper perfectly and popped out some of the holes. 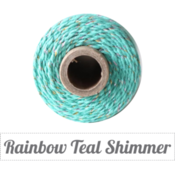 I wrapped some Rainbow Teal Shimmer twine around the butterfly "bodies" and left the ends loose to make antennae. I finished by folding the wings of the butterflies up a bit so they pop off of the card. This week we are actually heading to Missouri for my husband's aunt's funeral. She has bravely battled cancer for several years and finally went home. We are so sad but know she's in a better place and is out of pain. She's up dancing with the angels! Anyway, I made this card for my mother in law (it was her sister) and hope this can cheer her up just a bit during this tough time. I used a gradient of blues/greens watercolored over watercolor paper and stamped the sentiment in pale brown ink. I cut out the flowers using the Fairy Flower die and finished the card with some Solid Natural twine. Ah, I just love this die - Brevilla Houses - it will be so versatile!! I layered a piece of patterned paper over a kraft card base and then cut the houses out of woodgrain patterned paper. 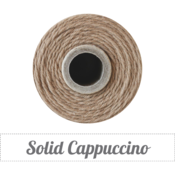 I added a coordinating sticker and brads to the card, stamped a sentiment on a coordinating die cut and layered it over some Solid Cappuccino twine. Love this! Here is the hop order for today and I hope you find lots of crafty goodness! Thanks so much for visiting today! Cooling Off - Serendipity Stamps Guest Designer! 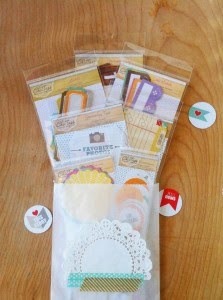 I am soooo very excited to be a guest designer for Serendipity Stamps' Challenge Blog this month! 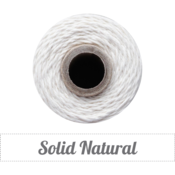 This is the second of two posts for July where all of the designers are using twine! Our first theme was "It's hot outside" and now we're cooling things off! One of my favorite things to do to cool off at the end of a hot day is to hang out in the shade of my yard! Serendipity has the most wonderful floral alphabet stamps that I thought would be perfect for this challenge! I kept things pale and simple for my first card, stamping the amaryllis onto some white cardstock and then adding just a bit of watercoloring in pale blue and green. I mounted the letter over some gold shimmer twine and some pale blue patterned paper. I finished the card with a few gold sequins. For my second card, I layered a couple of pieces of coral patterned papers together and then stamped and colored the JOY letters. I wrapped some silver twine for this one and did a bit of watercoloring as well. Thanks so much for visiting today and a huge thank you to Mary, Jeanne, and the entire Serendipity team for having me along for the ride this month! Hello friends! Today is my turn at the Waltzingmouse Inspiration blog so I hope you head over there to check out all of the amazing inspiration with Waltzingmouse Stamps. Instead of just a preview here, I wanted to share the story of little Roscoe Wackerly for whom I made this card. Little Roscoe was born 3 months premature and is the nephew of a crafty friend of mine, Tifany DeGough. Little Roscoe has had a pretty rough time the past month and can really use some prayers for healing so that he can live a full and long life. I check his story every morning when I wake up and every evening before I go to sleep and pray for some wonderful news. His story has touched my heart in a way I haven't been touched before I I'm really pulling for that little guy. Makes me hug Amelia tighter and I try to spend more quality time with her every day. Here's to you, Roscoe, for making my world a little bit bigger. And thanks, everyone, for visiting today! Hello friends! Today I'm up over at The Twinery blog sharing one of hopefully many more party ideas with you! Our daughter, Amelia, will turn one in September and I'm starting to worry think about her party! 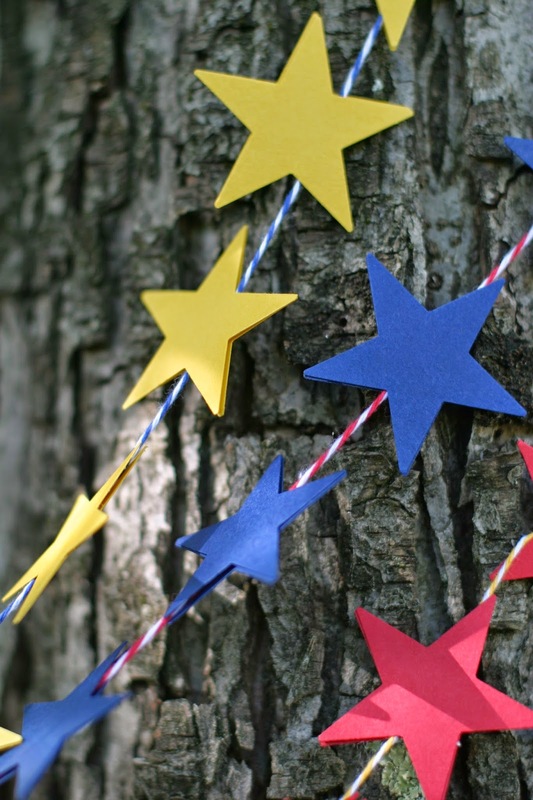 We've decided on a circus theme and I think these star garlands will be perfect decorations! I started off with 3.5' lengths of Twinery twine in primary colors (Marigold, Midnight Blue, and Maraschino stripe) and then used a star punch to punch zillions of stars out of coordinating cardstock. Okay, not zillions but it felt like it! Thankfully Amelia enjoyed watching the process because I have a lot more to work on before the big day! 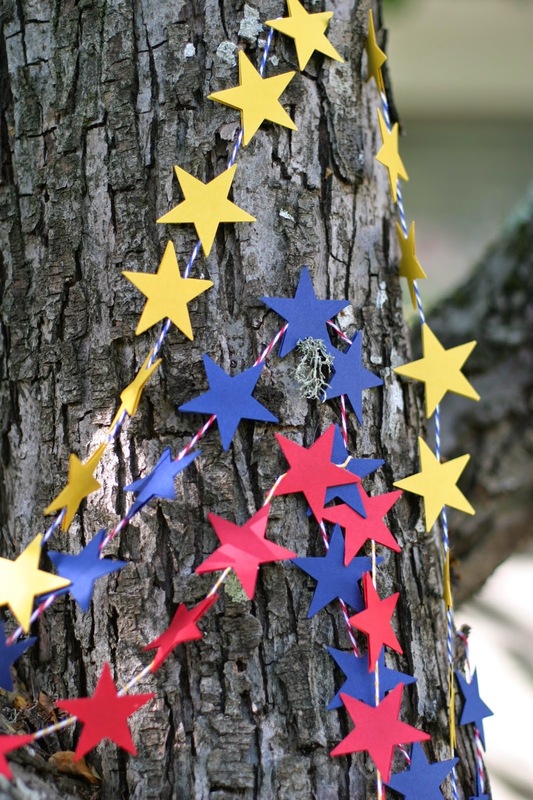 I glued the stars together over the twine so they can twist and turn in the breeze without showing an "underside." I think these will be perfect on the desert table and hanging over doorways. I'll be sure to share photos of my other projects for the party as well as the party itself! What I love about journaling cards and other decorative die cuts/tags is how versatile they are! I started off with a kraft card base and added a piece of grid paper, layered a journaling card, some gold shimmer twine, a tag, and some fun, wooden sequins for this card. I made it with my daughter in mind but it would be perfect for a significant other or a new baby! I thought this card would be perfect for an engagement or a wedding! I started off with a sky blue card base wound with gold shimmer twine and added the wonderful ampersand card (I just love that shimmery gold!) I finished the card off with some fun circular die cuts and some gold sequin trim. For this final card I thought it would be fun to make a little gift card holder out of a little bag. I used the sequin and "lovely" rub-ons to decorate the bag and layered it over some pink patterned papers. 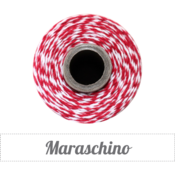 I finished the card with a circle die cut, some blossom stripe twine, and a few real sequins. Thanks to everyone who commented and a very happy Independence Day to you and yours! I've been saying all day that we used to stay up late for fireworks and now we get up early for parades! Life has been blessed chaos since the minute Miss Amelia Grace came into our lives and we figure out things as they come. She LOVED the parade today with all of the bands and even practiced her new waving skills! Adorbs! 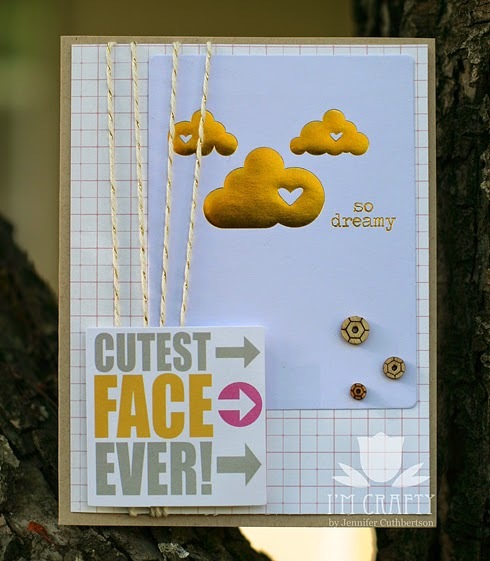 It's Hot Outside - Serendipity Stamps Guest Designer! Okay, now to the fun stuff! I am soooo very excited to be a guest designer for Serendipity Stamps' Challenge Blog this month! 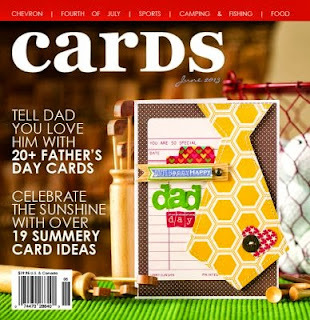 I've been a big fan for a long time and had so much fun playing with some really great stamps and dies! 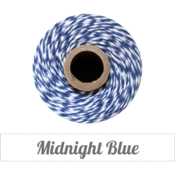 This month's theme is twine and I can't wait to see what everyone creates! For the beginning of the month, we're talking "it's hot outside" and boy is it where I live! You see, I'm about 15 miles north of San Francisco and since it is temperate most of the year, we don't have air conditioning. Ugh. Today it is 90 outside and just about the same inside my house. Blech. There are a few things I think of when it is hot outside - one is the 4th of July and the other is getting on the water! 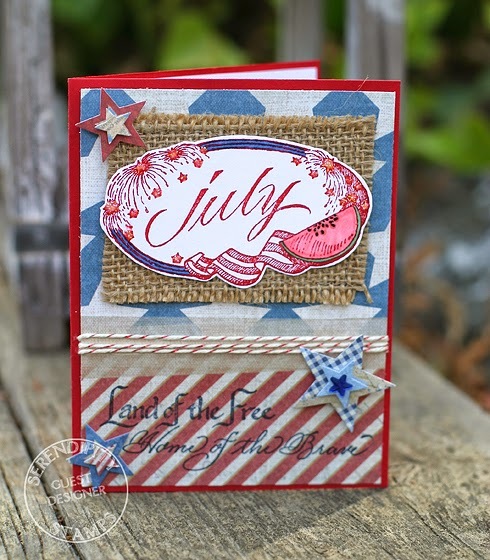 For my first card, I used the fabulous month of July stamp with wonderful imagery for the 4th of July, colored it with some Copics, and added some Stickles for a glittery touch. I cut out and layered the image over some patterned papers wrapped with twine, stamped the sentiment, and added a few die cut stars to finish it off. My next two projects feature boating and the ocean which is a wonderful place to spend some time when it is hot outside. 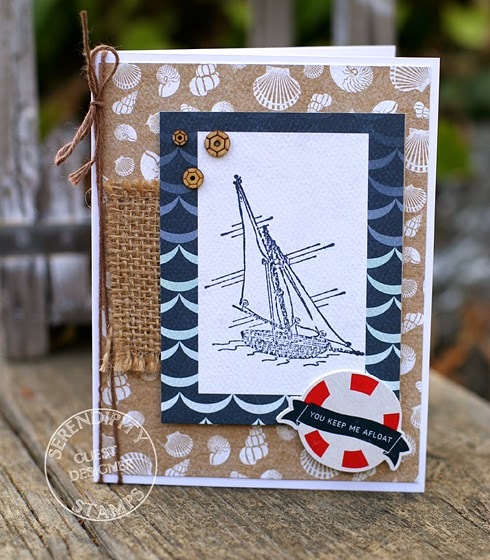 I stamped the boat onto a journaling card and added some fun embellishments and some twine to finish the first card. 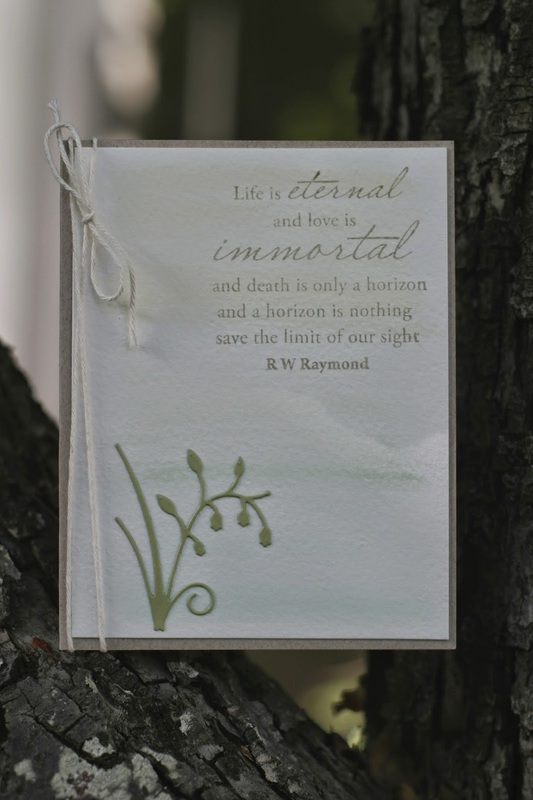 The second card has a wonderful sentiment stamped onto a journaling card (aren't they versatile?!) 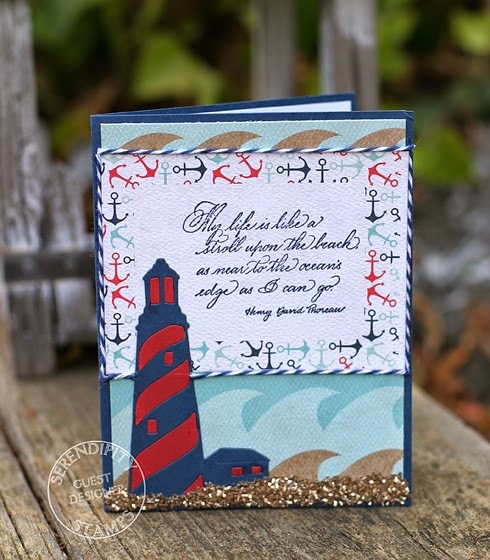 I die cut the lighthouse twice in red and navy and pieced it together and finished the card with a twine "frame" and some glass glitter "sand." Thank you so much for visiting today! It has been an honor to play along with the very talented team at Serendipity Stamps and I look forward to another post later this month!